Square Cash launches Apple Watch app. 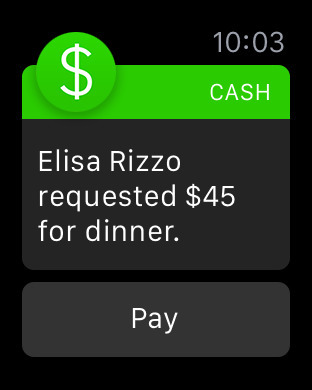 Square today announced that it has updated Cash app for iOS to make it compatible with the Apple Watch. Square Cash lets you quickly exchange money with friends. No "cashing out" - money deposits directly to your bank account. It's FREE between friends, and only 1.9% for businesses!